The QNX Bentley Continental GTC is the product of a rare and wonderful thing - one person putting their hand up in a meeting and tentatively saying 'why not use a Bentley?' To this lowly software developer we salute you because if you're going to create a car of the future then yes, why not use a Bentley. QNX is the software company behind BlackBerry 10, it also happens to be fairly good at making in-car operating systems as well, in fact over half of all the cars in the US have QNX software running them. The Bentley concept then is more than just a car with a fancy media system, the boffins have completely gutted its computer hardware and replaced it all with a swanky new system that's running on BlackBerry 10. The first thing you'll notice is the centre console. It's enormous. QNX has installed a 13-inch rear-projection touchscreen that also happens to be curved. They've also replaced the instrument cluster with a single display that can show everything from directions to the song you're currently playing. Thanks to an embedded SIM you can call people over BBM Video and BBM Voice, and to prevent any accidents the car will switch from video to voice the moment you start moving. One of its other neat tricks is 'Pre-Touch' which allows you to control aspects of the display without actually touching the screen. While it uses a different technology it's not unlike the Samsung Galaxy S4's Air View feature letting you your hand above the screen, which makes a quick access menu appears. Of course if you'd rather interact analogue style, the clock bezel doubles as a click wheel. Impressively though, it's not actually connected to the software instead it uses the same Pre-Touch sensor to detect movement. If that wasn't enough, QNX has built a web app for the BlackBerry Z10 which effectively turns the phone into a remote control. You can change the music, air con and raise and lower the windows all through the app. Using a prototype 3D-mapping service you can search for a location on your phone and then upload the directions into the car's navigation system before you even get to the car. Naturally being a smart car, there's voice control - say 'Hello Bentley' and a small pulsating HALesque light appears at the top of screen. It'll understand most commands letting you effectively talk to the car without having to sound too much like a piece of souless software. 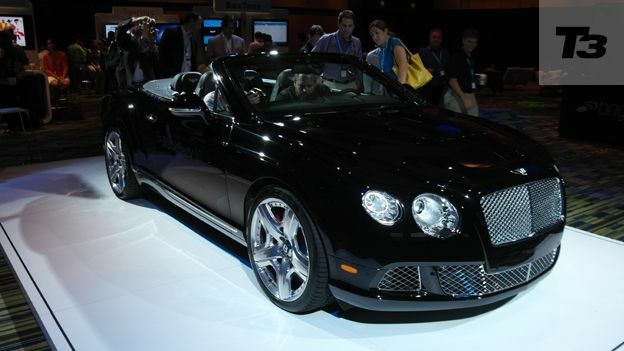 While it's certainly a mouthful to say, the Bentley Continental GTC QNX is a triumph of technology meeting design. Yes some of the technology is in its very early stages but even in its current form it looks and feels miles ahead of the current market. Do we need a smartphone remotely controlling the aircon? Probably not, but having the option means you now want it in every car. The pinnacle though, has to be the curved touchscreen with 'Pre-Touch' technology. While the Software Developer confirmed the technology was still in its infancy it wouldn't be long before we were all going Minority Report on the dashboards of our cars.